Does the stress of traveling get you down? While you’re busy juggling flights, luggage, hotel reservations, and itineraries, let Affordable Rent-A-Car and Sales handle the ground transportation. Located just 2 miles from the Salt Lake City International Airport, we are the best option for airport rentals and can get you on your way quickly and painlessly. Here is our simple process for convenient and affordable car rentals from our airport location. Selection: Our airport location offers a large selection of cars, trucks, SUVs, and vans to meet your rental needs. Whether you are traveling for business or pleasure, with a group or on your own, we have exactly what you are looking for. Prices: There is a reason we call ourselves Affordable! We consistently offer lower prices than our competitors and we offer so much more in options and convenience. Complimentary Pick-Up and Drop-Off: With Affordable Rent-A-Car, there will always be someone waiting for you at the airport. One of our professional team members will be waiting when you fly in and will take you directly to our office. We are close-by and ready to help you get on your way! 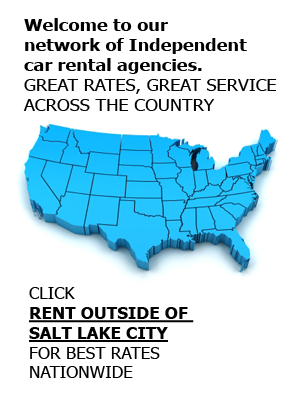 Affordable Rent-A-Car and Sales is a family-owned and -operated company, and has been providing great customer service and convenience to the Salt Lake City area for years. We also serve surrounding areas such as Park City, UT, Yellowstone, and Jackson Hole, WY. Our team offers free pick-up and delivery from your home to our office, so that you can hop in your rental and get on the road even quicker. Scheduling a shoot or scouting for a perfect location? We offer production vehicles with plenty of room and storage for cast, crew, and equipment. What are you waiting for? Book your airport rental today by contacting Affordable Rent-A-Car and Sales at (801) 266-7368 or by making a reservation online.